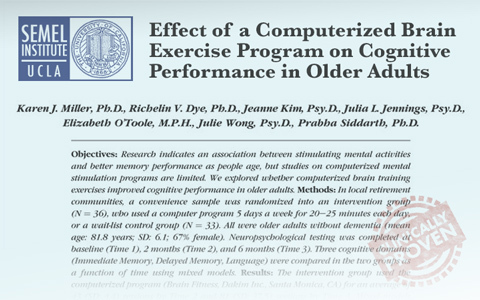 Age-related cognitive decline is the greatest threat to the wellness and quality of life of your residents. Getting the most out of life depends on having a sharp mind and keeping it that way. So it’s no surprise that age-related cognitive decline is the greatest threat to the wellness and quality of life of your residents... and their greatest fear. Dakim BrainFitness Professional is the clinically-proven, evidence-based brain-training program specially created to enable senior living providers to help their residents improve and protect their brain health. With exercises created to appeal to users over age 70, and many unique functions and features that make Dakim BrainFitness Professional easy, practical, and economical to use for senior living providers, Dakim BrainFitness Professional has become the #1 brand of brain fitness in senior living — in use in more than 500 communities across North America! See below for a map and a list of senior living communities and senior centers offering clinically proven Dakim BrainFitness. Costs only $3,500 a year — that works out to less than ten cents a day, per resident, for an average community (100 beds)! And for communities with less than 50 beds, the cost is just $35 per bed, per year. As a result of unprecedented media coverage over the past few years, residents, prospects, and their families are acutely aware of both sides of the brain health issue — the threat of Alzheimer's, and the evidence that brain fitness activities can improve cognitive function and protect the brain from long-term decline. Dakim BrainFitness Professional has been clinically proven to significantly improve cognitive performance in the two most important areas — memory and language abilities. Designed for senior living, Dakim BrainFitness Professional has been clinically proven to significantly improve memory (immediate and delayed) and language abilities, the two aspects of cognitive function that (1) have the greatest impact on quality of life; (2) are the most noticeable to individuals, and; (3) are of the greatest concern to people over age 50—memory (immediate and delayed) and language abilities. These gains were achieved as users strengthened attention, focus, and concentration. And more than two decades of medical research has concluded that long-term participation in rigorous cognitive stimulation, where multiple domains of the brain are exercised routinely — creating what brain researchers call a cognitive reserve (a reserve of neural connections) — is associated with as much as a 63% reduced risk for dementia! You know that anytime you offer a service that effectively enhances the wellness and quality of life of your residents, you're doing the right thing. But don't overlook the important bottom-line business benefits that such programs can create. Healthier, higher-functioning residents infuse the entire community with their vitality, they require less care, and most importantly, they live longer! And very likely, they and their grateful loved ones will spread the word about the wellness programs offered by your community. To keep census high in today's tough economic climate, you're having to compete harder than ever for every new resident. Relying on costly financial move-in incentives to persuade prospects and their families to choose your community is an expensive way to go. But the census-building game — and the reasons why prospects and their families choose a senior living community — is changing. Increasingly, substantive programs that help residents enhance and maintain wellness and quality of life are becoming the most important criteria (after cost and location) in choosing one senior living community over another. Offering a clinically proven brain fitness program, such as Dakim BrainFitness Professional — as part of an overall wellness program — can be an important differentiator for your community, providing a meaningful incentive to prospects and their families to choose your community as their new home. While this is not likely to entirely eliminate the need for all financial move-in incentives, marketed properly (emphasizing the significant potential impact on long-term wellness and quality of life), substantive wellness programs can provide a more cost-effective tool with which to influence a prospect's (and their loved one's) decision and reduce the overall cost of building and maintaining census. Dakim BrainFitness has always been truly affordable — only $3,500 a year. That works out to less than ten cents a day, per resident, for an average community (100 residents)! And for communities with less than fifty beds, the cost is just $35 per bed, per year. But until now, if you wanted to offer clinically proven Dakim BrainFitness to your residents, you could only do it on Dakim's proprietary Touchscreen computer appliance. But now with our latest release, it's even more economical, because you no longer need to purchase a separate Dakim Touchscreen, if you don't want to — Dakim BrainFitness now runs on PCs, Macs, and iPads — yours and your residents'. Let’s do the math: Each new resident, on average, brings in $4,000 per month to the community, or roughly $50,000 per year. The cost of Dakim BrainFitness Professional is about $35 per year, per resident. If actively marketing a dedicated brain health program brings in just one new resident (or enables the community to close the deal with fewer financial incentives), the return on investment is huge. Easy to Administer. Easy to Use. Cost Effective. Designed for senior living, Dakim relies on smart technology to make delivering a highly effective and customized brain-training program to each of your residents, easy, and highly cost-effective! DakimADMINRegistering residents, monitoring their usage, and measuring their performance over time with Dakim BrainTrac™ reports is a snap, using Dakim’s online application called DakimADMIN. 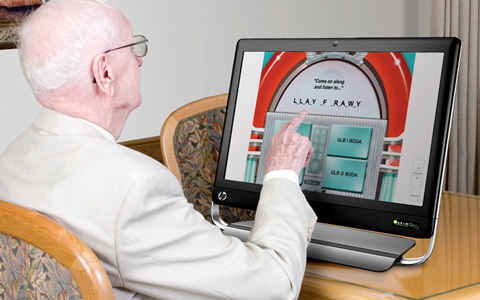 SeniorCentric™ User InterfaceOur intuitive SeniorCentric™ interface makes everything easy-to-see, easy-to-read, and easy-to understand — the result — little or no training of staff or residents required. EasyTouch™ Log-OnOur EasyTouch™ Log-On Sequence does away with user names and passwords, letting residents start their session by simply entering their first and last initials (on the touch screen) and then confirming their identity. And because everything is automated, once they've started their session, the program guides them through every step. Adding to the ease-of-use and convenience, residents can do their sessions on any Dakim unit in your community, and not see repeated content. 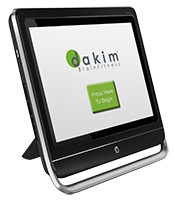 Dakim's touchscreen computers communicate with and update each other nightly, with new content and user session data, via your Internet connection. With our latest release, Dakim BrainFitness now runs on PCs, Macs, and iPads—yours’ and your residents', so your residents can do their sessions on any PC or Dakim unit in your community, or their own Macs and iPads. Additionally, with a resident's permission, DakimADMIN can track how a user is doing in each cognitive domain over time. This tool can serve as an aid in seeing possible cognitive decline or to assure residents (and their families) that they are holding their own and doing just fine. Bottom Line: Virtually every resident — regardless of their level of cognitive functionality or computer experience — can successfully use Dakim BrainFitness Professional with little or no staff assistance! Many of your residents lead busy, active lives and most likely, are not “in the market” for another time-filling “activity.” But Dakim BrainFitness Professional is not an activity — it is a clinically proven brain training program that can have a profound impact on the quality of their lives. Living a highly active life depends on keeping your mind sharp. And keeping minds sharp is exactly what Dakim BrainFitness Professional delivers! First introduced to senior living communities in 2006, Dakim BrainFitness Professional is now the #1 brand of brain fitness in senior living, used in more Independent Retirement and Assisted Living communities, Adult Day Centers, Memory Care Centers, Veterans Centers, Skilled Nursing Facilities, and Area Agency on Aging senior centers than any other brain fitness program. Dakim BrainFitness Professional, the #1 brand of brain fitness in senior living, is used in more Independent Retirement and Assisted Living communities, Adult Day Centers, Memory Care Centers, Veterans Centers, Skilled Nursing Facilities, and Area Agency on Aging senior centers than any other brain fitness program in North America. Nikkei Senior Gardens by Seniority, Inc.
River Landing at Sandy Ridge by The Presbyterian Homes, Inc. I absolutely love using the Dakim program. In fact, when we went to Australia to visit our son and daughter-in-law, I made sure to bring my Dakim disc along so I could use it there! And I brought my laptop to Florida on a trip, just so I could do the Dakim program and I plan on bringing it to Montana next month when I visit my brother and sister (both in their 70’s) so they can see it as well. I know they will get a kick out of it. Having recently retired from 33 years as a School Social Worker, I find that although I do love the quiet and calm of my new life, I miss the mental challenges and quick thinking needs that existed on the job. Using Dakim regularly helps speak to that need. I spoke to another retiree about that benefit and he said he did miss those mental challenges of the work place and was going to look into your program. I’ve also noticed that I am remembering numbers better... as in looking up an item in the index of the book, I am more apt to remember the page numbers. (Hmm.... the Mambo game!) I’ve noticed as well that the "Odd Couples" exercise has helped with recall. And too, I pay more attention to detail in a visual field and am thinking that the puzzle exercise must help with that. I very much like the variety of exercises and that it changes day to day. Yet I like the structure of the routine as in always starting with the calendar and a fact about the date. I find myself referring to those facts in conversation as in recently saying to a friend: "Did you know that today was Dr. Seuss’s birthday?" To which she replied: " I wondered why there was a display of his books in the library!" Has your team thought about adapting this for an I-Pad? Always a new challenge, right? Thanks so much for the hours of hard work you are doing to make this a reality. I for sure am going to keep it up. I really am excited about this program. It is a very delightful way of keeping one’s mind active across a variety of activities. Occasionally, I have a problem with attempting to move along quicker than my fingers can respond and I end up making unintentional errors. Another difficulty I have is when I am asked some long-term memory facts on items that were never a part of my knowledge base. The strategies that are taught to assist one in remembering a series of items or unrelated facts are very helpful and can easily be applied outside of the program in daily living situations. The items that involve critical thinking skills have been particularly helpful to me as these are situations that I am not challenged by in normal daily living. I absolutely love the program and am so happy that I have this opportunity to keep my brain active. I am also glad that I was able to purchase the program at a reduced price because, being on a fixed income below the poverty level, I could not have afforded the full price. I usually try to work on it once a day. So far, I have missed only one day when my computer was inoperable. My computer has had some problems which may have interfered with the continuity of the program. I am also applying the opportunities made available to keep track of my personal progress. This is a great aspect of the overall program because I continually attempt to do better each day. Dakim BrainFitness enables us to offer our residents in all of our care settings, a powerful brain fitness program — whether they live in our affordable housing communities or in our CCRCs. It’s like going into an exercise room for their brain... and its fun. And that’s the only way you’re going to get folks to continue using their brain. It’s a lot more fun than doing the crossword puzzle or Sodoku. It’s different every day. It was easy to set up. Being a speech pathologist by background, I’ve seen an excellent variety of cognitive exercises. I doesn’t just focus in on one type of exercise... it exercises many parts of the brain. What’s great about Dakim is they’ve thought this through. There’s no keyboard. There’s no mouse. It’s all touch screen, so it’s very easy for the residents to operate. Another great thing is they actually upload new information constantly, so it gives the resident a new experience each time. Our residents go regularly. They really, really enjoy it. It’s a great selling tool as well. I’m really pleased with it. We’ve seen such a tremendous improvement in their quality of life... with people beginning to talk for the first time in 2 years. Dakim has definitely helped us increase our market share. The great thing about Dakim BrainFitness...It helps to build new connections in the brain at any age. This is so much fun, that it just gets you hooked on it and you want to do it every day. 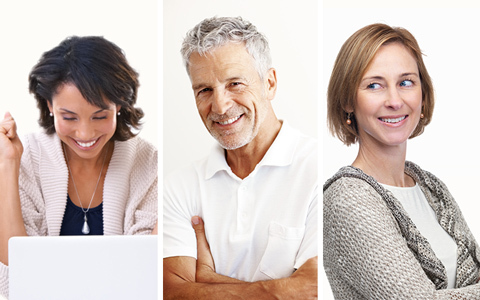 Our company focus is on maintaining the health, wellness, dignity and independence of each resident; and we recognize that maintaining one’s cognitive health is a very important aspect of successful aging. Dakim’s program is unique in it’s ability to address the brain fitness needs of each resident individually, and over the past year our residents have reported that the program has made a real difference with their memory abilities. The expansion of the program is logical given the outcomes, and yet another reason why BMA continues to be a leading innovator in affordable senior housing. We have seen improved memory upon annual care conference review...of course one would have to take all life factors (changes, medications etc) into consideration here, but the fact remains some improvement has been noted. Another benefit to the machine is the fact that residents are able to use it independently. This makes a great difference in their interest in keeping themselves sharp; they feel they have some control over their situation. They do feel the self esteem results that come from keeping your brain and body fit and, of course, they report feeling much sharper all day if they start off challenging and achieving! This continues to result in positive results to the resident, of course. It is also good to note that at times residents have other health matters and /or concerns and at these times the Dakim offers that routine to their day that they so need to feel in control of their lives, despite their health concerns at the time. We count the Dakim brain machine as a great asset to our facility and we look forward to a long relationship with your company. All of our residents enjoy Dakim BrainFitness immensely. It is very easy to use. It takes no time away from my normal schedule. I did in fact receive a 10 day Free Trial of the Dakim Brain Fitness Program. I work in the Senior Living Indusrty and was asked to try it out and let my employer know what I thought. That employer did not decide to move forward with plans to bring it to the community where I worked. However, the community where I work now just signed up with Dakim, received the equipment and is now getting the residents set up on it. I am thrilled, I know that they are going to enjoy it. I did!